The Long Man of Wilmington, East Sussex, United Kingdom. Reported 3rd July. Creating the Story: Continued… Oh, Man! The star formations at Harewell Lane, 20/06/2014, Acklng Dyke, 07/07/2014, and at The Long Man of Wilmington, East Sussex, 07/07/2014, are images that could be seen as the representations of the continuing story of Creation with Human Consciousness being the goal and the leading factor in the process of Evolution. The hint for this last statement is the number five and the five-pointed star which are the bases for these three formations, and the fact that the last formation is near a huge ancient image of ‘MAN’. Notice that the circlemakers chose to place this most recent star formation near an ancient image of a human that has no reliable distinguishing feature identifying its gender as opposed to choosing the more obviously male Cerne Abbas Giant. 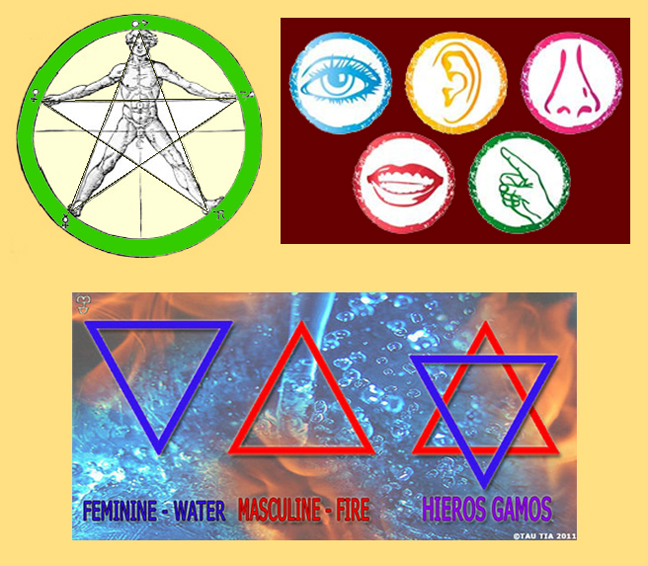 Five is the number of the human microcosm; the human body with outstretched arms and legs forms a pentagon; the five senses are the avenues by which we interact with the world; ‘5’ represents the ‘hieros gamos’, the sacred marriage, as it is a combination of ‘2’ (feminine) and ‘3’ (masculine); the merkaba shape in 2D , a symbol of the ‘hieros gamos’ as well, can be derived from five when TWO TRIangles are joined. 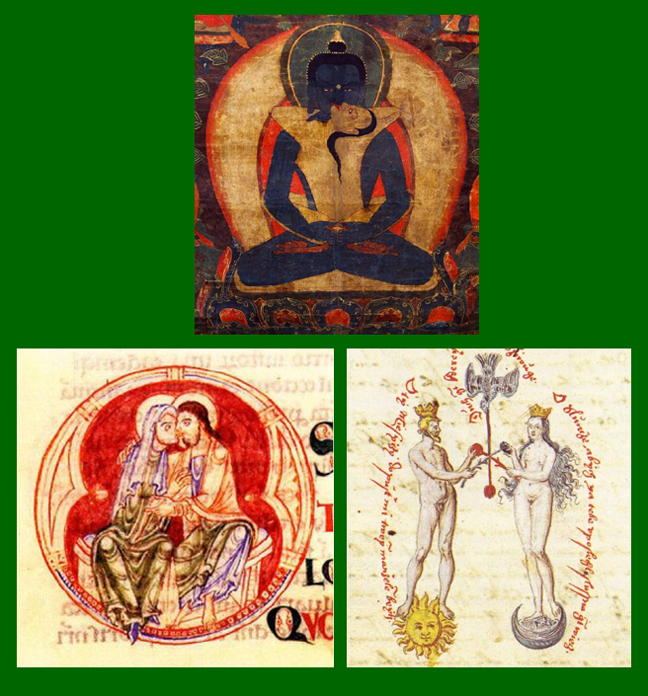 The symbol of sexual union between man (3) and woman (2) is most appropriate for representing the sacred marriage because it depicts the union of psychic opposites within the individual. It is the goal of individuals who are seeking a wholeness of being and consciousness. At a practical level it represents the use of both feelings/intuitions, AND, reason/logic by a person when facing life’s progress and challenges; the alternative is reacting in a one-sided manner that usually produces more difficulty. In my essay on Harewell, I mention that it could symbolize warlike stances as derivatives of the idea that the Venus star is a guiding, and therefore a protecting light and good for protective insignia etc. Just comparing this image to the ‘star’ at Ackling Dyke and then to the one near the Long Man, one feels that it has a fixed, solid and immovable nature. Like defensive stances and attitudes that trigger aggressive actions, this formation reflects castle walls, targets, and righteous ideology. These modes of thought have been, and in many instances still are the ways mankind operates in the world in the name of survival, ‘good’, politics and economics. The archaic use of the pentagon in defensive and aggressive war tactics is no longer useful for a global understanding of human existence. Tribal, national and partisan divisions once served humanity by providing stable relationships and environments for developing civilization. Now, at this point of the Global Village, these fragmentations of human commitment do not serve the greater good. The five-pointed pentagram and the pentagon must now represent a next step towards the global community of the human race. On to the beauty at Ackling Dyke and we see another five-pointed star, but with an ‘open’ form, with accessory ‘arms’ or reaching forms coming from the center and with a central system of joining lines that render an impression of interconnection, co-operation and co-ordinated movement within. The ‘reaching’ crescent forms look like figures with arms reaching outward and upward, openly. Around the ‘heads’, in standing crop, are dark crescents. The moon, most often symbolized by the crescent, is associated with the mind through the two language systems, Sanskrit and Latin. ‘Mana’, the Primal Moon Mother, is derived from the Sanskrit word ‘manas’ meaning ‘mind’. In Latin the word ‘mens’ means both ‘mind’ and ‘moon’. At Ackling Dyke the figures’ ‘minds’ are made of both dark and light crescents: knowledge and understanding coming from the unconscious and conscious experience; intuition and spiritual inspiration; emotion and rationality. The essential characteristics in this formation are the openness of the form and the labyrinth-like interconnectedness of all elements to make the whole. It is a reflection of the potential dynamic possible to humanity in its development towards the ‘new’; it is a representation of the positive purpose of the many paths in life. This image reflects the openness so exquisitely represented at Ackling Dyke. At Wilmington, the Long Man stands before a circle encompassing a five-pointed star that seems to be sending vibrations out towards the edges of the cosmic circle. 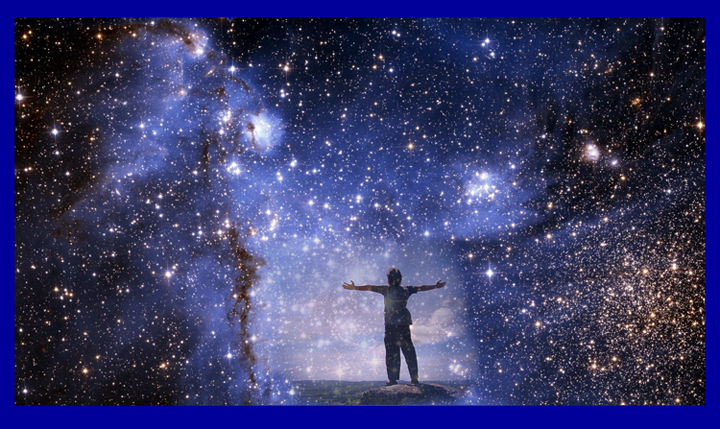 It is the activation of the effect that humanity as a whole may offer to the reality of the cosmos. The visitors seen in the center star seem to validate the idea that from the center of our being we may reach out and project into the Cosmos. We as a species are on the edge of becoming a conscious planetary contribution to the universe, and in doing so we become partner creators of reality. The Long Man of Wilmington in winter with his staves; the Cerne Abbas Giant with club; Finglesham buckle with Odin holding spears looks similar to Longman. Some say the Wilmington man, as Balder, is ‘pushing back the gates of night’. (cantab) Whatever he is doing, he looks a lot less aggressive than the giant with a club. In relation to the crop formation, it is most likely emphasizing the idea of ‘Man’ represented by the star and pentagon shapes. All this idea stuff may seem so grandiose and immense that no individual could possibly engage with it in daily life. But that is the whole message: that each of us humans in each daily life, each individual activity, each personal creative act, each feeling and each thought is essential to the whole because, COLLECTIVELY WE ARE THE WHOLE, and a whole needs all its parts.